This new book is by the co-author of The Salmon Bears and The Sea Wolves, both awesome nonfiction books about the amazing wildlife of the Great Bear Rainforest. As you can tell from the title, this book is a little more urban. Each chapter looks at a different type of animal and shows which species have evolved to live in an urban setting. We see animals that everyone thinks of like rats, raccoons, pigeons, cockroaches, butterflies, and seagulls and some that might be surprising; cougars, moose, sea lions, alligators, and herons. The final chapter discusses what people can do to help the wildlife in their urban area. There is also a glossary, resources, and index. 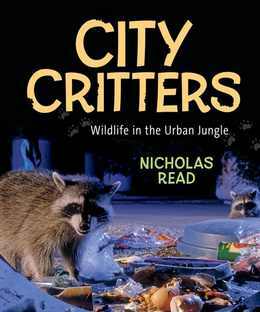 Each chapter, in addition to the main text, includes lots of photographs and insets with additional information about the various animals, scientific information, and stories about animals in urban settings. I found the final chapter to be somewhat disorganized. The author is obviously passionate about wildlife and concerned about humans encroaching on their environment, but the chapter seems to jump around a lot and some things, like feeding hummingbirds in the winter and not the spring, aren't explained. Verdict: Other than my minor quibbles with the final chapter, this is a really good overview of urban wildlife in North America. It's a fascinating read for both children and adults and with the interesting, brisk pace of the text, lots of photographs, and clear, simple glossary this will be a favorite for animal lovers and kids looking for a subject for reports. I'm really kicking myself that I didn't get around to reading it until it was too late to nominate for Cybils! So, lots of manga reading (yes, most of it at the last minute, but whatever). It did get easier to read right to left after a while, but that was never really a huge issue for me, since I've studied languages that run that way. I did pick up on the panel design more easily, and it also got easier to tell characters apart. Ultimately, I'm still not really a manga fan. I found two series that I'd like to read more of, Lizzie Newton and Fullmetal Alchemist, and maybe a little more XXXHolic but that was it. I found most of the art to look pretty much the same and that got very boring. Also, I'm really not a sequel person - I want to read a book and get a fairly complete story. Most of these first volumes were just set up for the rest of the series, but the thought of reading another 10, 20, or 30 volumes was pretty echthl (sticking out tongue noise). It seems like a lot of the manga I read is either action and nothing else or endless dialogue and that didn't interest me. I like mystery and action with only a little gooey emotion - but definitely a little. Some people did recommend more intricate/adult stories, but really, they're not the thing I'd read as prose, so why read them as manga? Anyways, I can now see a little more of what the teens like about this form and why, so I'll have a better idea of what to order. 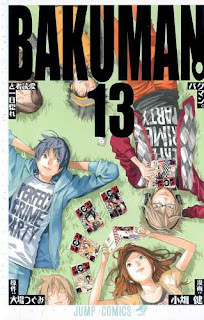 Although, honestly manga is rather like ordering kids' dvds - generally doesn't matter what I get, they'll check it out. I enjoyed some of the books I read and found a few more I'd like to read, so it wasn't wasted time personally either. And that's all for my 2012 New Year's Resolution projects! Now...what shall I do next year? 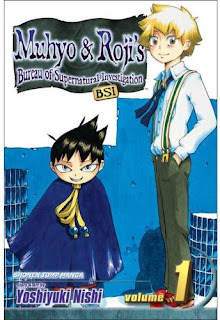 This is the only manga people recommended to me that I turned out to actually like. It reminded me a bit of the early seasons of Avatar - funny, exciting adventure, faint hints of political issues and other dark hints, but not detracting from the essential fun of the story. I read all three of the volumes in this collection and intend to read a few more, at least until it gets depressing which it hints that it will at some point. The art was pretty typical, but it helped to tell them apart that they're made of different amounts of metal. 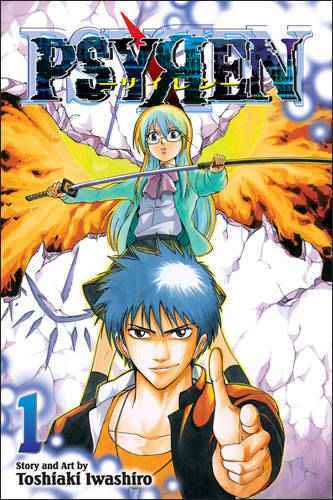 This reminded me a bit of the Beet the Vandel Buster volumes I read, but it wasn't something I enjoyed. Too many exclamations and I've never been a pirate fan. The art style in this was very different, a lot easier to follow, but I found the story endlessly boring. I'm not really interested in the endless permutations of relationships, even in historical fiction with various political and class struggles or whatever. Pretty typical alternate world fantasy. Kids get mixed up in fantasy war on alternate world, get transported there or something. Didn't interest me and the art was pretty-pretty in places but ultimately hard to follow. 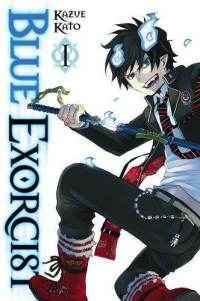 An interesting premise - an orphan discovers he's really the illegitamate son of Satan, his foster father (a priest and exorcist) is killed protecting him, and he decides to become an exorcist. His younger (non-demonic) brother who he always thought of as weak turns out to be an expert exorcist and now he has to go to school with him. Too many plot points and too much exclamation in the dialogue for my taste. I got conflicting recommendations on Clamp titles, some people saying they weren't good choices to start Manga reading on, others saying they were. I decided I might like them since they sounded "different" and I'm pretty sure by now that the usual popular manga isn't to my taste. I did actually like this quite a bit. It was interesting, mysterious, and definitely different. I did find the endless philosophizing rather annoying - a bit like listening to a teen who has just discovered the wonders of some ancient philosophy or religion and can't wait to impart them. Anyways, the art was interesting and not too hard to follow. I might read a little farther in this one to see what happens. This was...pretty much the same concept as Drifters, only with random people being picked to play in some sinister game, which appears to be set in a future wasteland/dystopia. I had trouble telling the characters apart. It was mildly interesting, with the urban legend coming to life, mysterious girl, guy who acts tough but really likes to help people, but can also go totally berserk, but it just wasn't interesting enough to read more than one volume for me. 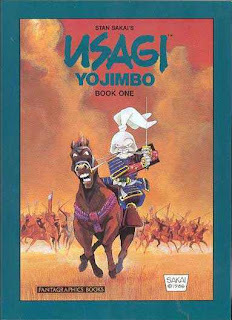 Ok, I get the first part - warriors are being pulled into this alternate world, this particular warrior is a Japanese samurai (despite what appears to be to be historically inaccurate details and behavior). Strange world, elf-like creatures, mysterious powers....and then everything went nuts. Different mysterious powers, different people killing other people, or maybe they're the same people and...I don't get it. And that guy does NOT look 30. I'm guessing this is Korean maybe, by the author's names? It didn't read right to left, which was a little easier. 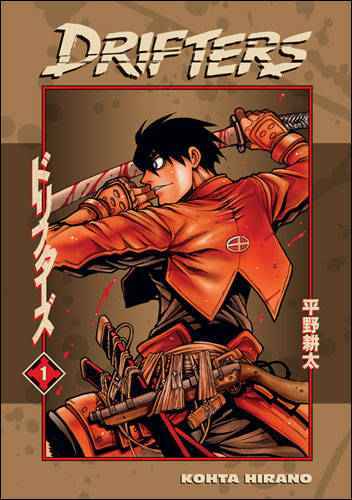 Anyways, I actually really liked this one and would even be interested in reading a sequel. Lizzie is a young society lady who writes mysteries and is interested in crime. She encounters a mystery and delightedly plunges into solving it. 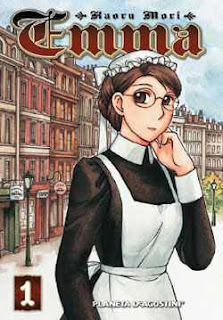 Other characters include her steward, who used to be a famous barrister, and seems to be both in love with her and also have a sort of adopted familiar relationship and a young Scotland Yard detective who's a little like a proto-Sherlock Holmes (although his misogyny doesn't stand up to Lizzie for long). The art is pretty, I could tell all the characters apart, and I even kind of liked the chibi bits (I assume that's what it is when the characters get tiny and yell stuff that is historically out of place?). Of course, I can't see many teens being at all interested in this. Sigh. This title was nominated for Cybils, otherwise it's not one that I would have picked up on my own. I can't say I really enjoyed it. I understand the premise - I double-checked the plot online so I would understand what's going on - but I found it boring. The whole thing seemed to be exclamations and random dialogue and all the characters looked the same. It might have been clearer if I'd started with the first volume, but no way was I going to read 13 extra volumes of this. 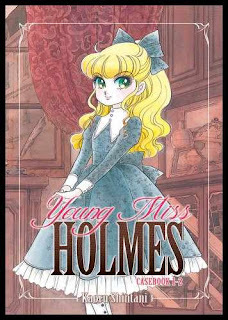 There are four stories in this collection, each one a classic Sherlock Holmes story. However, they are told from the perspective of his niece, Lady Christie. Some of the stories have additions or changes. "The Mazarin Stone" is pretty much the straight story with Christie helping out here and there. "The Problem of Thor Bridge" has a twist at the end and Grace Dunbar becomes Christie's governess. "Red-Headed League" has Christie pop up at the end of the story to help out and deductions along the way. "The Adventure of the Sussex Vampire" is the most changed, with Christie encountering a real vampire who saves her life with the "rose kiss". "The Adventure of the Dancing Men" is mostly the same as the original story, except Holmes is in Brighton and Christie and her maids and governess do all the code-breaking. Christie isn't really a partner with Holmes, more a competitor, trying to win his attention by being as or more clever. She's precocious and can follow social mores when she wants, but she rarely bothers. She's drawn looking very like a doll and actually poses as one in Mazarin Stone to trap a thief. Asides from a few manga conventions that weirded me out (like the whole doll thing) I actually liked this one pretty well. The art was pretty and easy to follow and I like Sherlock mysteries. I disliked the Sussex Vampire, which went careening away from the story to focus on vampires, and I've always found Dancing Men boring, but otherwise I rather enjoyed this collection. I wouldn't read more though and I don't see this as something that would interest most teens in my library who read manga. Borrowed from another library in my consortium. I received a copy of this title for Cybils. 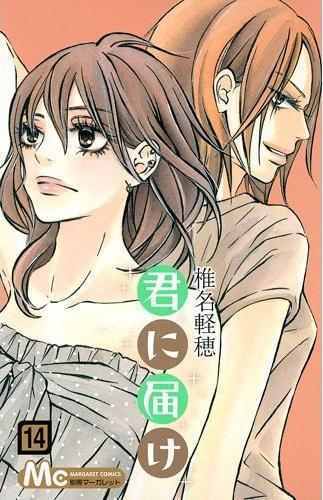 It wasn't like any of the other manga I've read so far - it reminded me a little of My Neighbors the Yamadas. There are a number of short stories, each in the same style of wiggly lines and circled eyes. It's not exactly black and white, more sepia tones. The art style wasn't to my taste at all - it felt more like a sketchbook, or one of those really arty graphic memoirs that are of interest mainly to the creator. Along those lines, I have a hard time thinking of a teen this would appeal to. The stories talk about two elderly people who are seen as odd by their neighbors, a girl (college student?) who makes up stories about her parents, a student whose friends think she is romantically involved with her professor, etc. In other words, the stories are equally divided between stories about young adults who appear to be college age or just graduated and elderly people. The pace is reflective and thoughtful, with little touches of sweetness and silliness. I wouldn't buy it for the teen collection, but maybe the adult if there were fans of this artist's work. 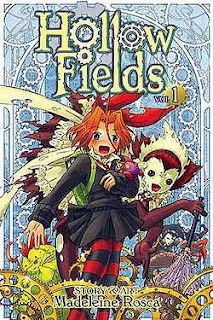 Review copy provided by Viz Media for Cybils. 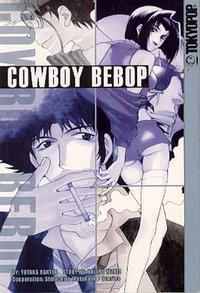 I really liked the premise of this manga, a misfit group of bounty hunters traveling across space, looking for high bounties and good food. Very space opera, which is a genre I like. It was pretty easy to follow the art in the different stories, but I wanted more information on the various characters and the different episodes seemed very disjointed. 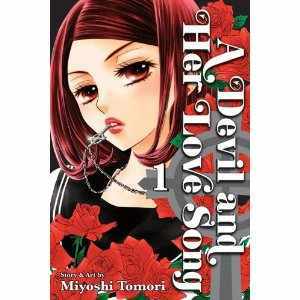 This is one I might make an effort and see if I can find the anime, since I think I might like that more. Meh. Tried the anime, it was interesting, but didn't grab me. I just wasn't in the mood I guess. Purchased with my own hard-earned pennies. This was kind of manga noir. A tough, not really innocent detective is executed for a crime he didn't commit. He gets a guardian angel, who is rather tarnished herself, and the job of saving other innocents. Only he's really more interested in revenge. I had trouble following the storyline and it felt lacking in spots. I wanted to know more in a more linear fashion than it was offered. 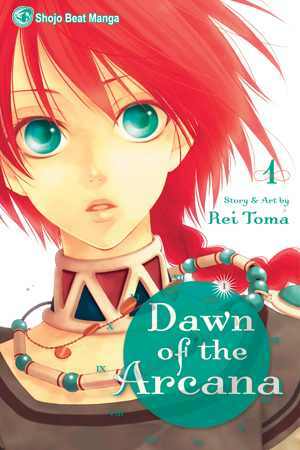 The art looked pretty much like most of the mangas I've read so far. 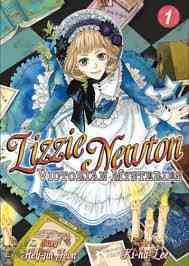 A little girl goes to her new boarding school, but accidentally enrolls at a school for mad and evil scientists. Along with all the other problems of starting a new school, and starting at an evil steampunk fantasy school with mysteries, the student with the lowest grades gets sent to "detention" and never returns. This was one with lots of exclamations and the characters doing that weird freak-out thing. This got annoying fast and I was frustrated that I couldn't really seem to grasp the story with all the different characters. I don't think I'd hand it to any kids who stress about not finishing their homework (heh heh heh) but it was a cute story with lots of mysterious fantasy mixed in. 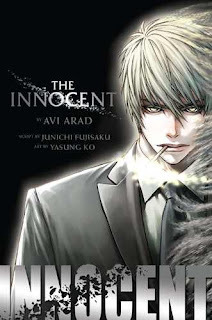 Roji is an innocent, low-ranking clerk, Muhyo is a genius Executor. Only Muhyo can use magic law to exorcize and punish ghosts. The various stories have them encountering various ghosts, pretty much all horrible, although some are redeemed. Roji sometimes falls for the girls they help, but Muhyo is firm about not mixing with "commoners". I would guess that the creepy and horrible ghosts probably have some basis in Japanese folklore, but you don't really need that to enjoy the stories. They're actually pretty funny, although there are scary and tragic moments too. This is a story I'd really to read more of if it was text or a western-style graphic novel, but I still just don't like the manga style. Too many close-ups of talking heads and not enough background and settings keeps distracting and annoying me. 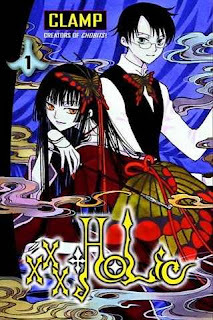 I really did not enjoy this manga, which I read for Cybils. I'm going to attribute that to a major cultural divide and a general dislike of teen books that focus on relationships and nothing else. I like at least one explosion per chapter in my graphic novels. As far as I can make out, Maria has been expelled from a Catholic school and has an almost magical ability to tell what people are really thinking and feeling. She is also emotionally damaged, having been told she is "tainted" and brings out the worst in people. Two weird boys both are immediately obsessed with her in different ways and all the girls hate and torment her. She also has a beautiful singing voice. There's a whole thing about "the lovely spin" which is a thing one of the boys has and Maria adopts - although it doesn't really work for her, because she's evil or something. Actually, it doesn't really work for the boy either, since nobody really seems to like him. There's also a theme of redemption and saving that mixes in with the Catholic school Maria came from, but I don't really see what she needs saving from, other than extreme weirdness. Then there's the art that starts each chapter, showing Maria in a variety of seductive poses. I got the feeling there was a lot going on and this story was a very specific title but I didn't get any of that because I don't have the context for it. Anyways, I ultimately found Maria's endless philosophical musings and weird interactions really boring and annoying, but this manga has been very popular in my library. This was pretty easy to follow. There are a lot of different characters but they all have very specific distinguishing marks. Plus, the story was...pretty much Pirates of the Caribbean with a few other cliches thrown in. Plucky young girl, doesn't want an arranged marriage, joins the pirates who are led by The Gentleman Pirate. They're off to search for a treasure. There's a new breed of pirate that are nothing more than rogues and killers in their way. Etc. The only problem with this story was that I don't like pirate fiction or fantasy. At all. Ever. This one I figured out very easily. It's not the type of story I'd pick up on my own, but it was nominated for Cybils and I can see how it would be very popular with the tween and teen girls at my library who love manga. It's basically a fantasy/romance and reminded me quite a bit of parts of Avatar. 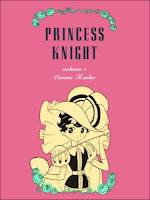 There's a princess from an impoverished country, despised because of her red hair, married to a nasty prince from the wealthy country (there's a civil war) but there's hints that he's really just trying to survive in the tough and dangerous political world and really finds her attractive. She's more interested in her bodyguard, a sort of dog-eared fairy type who's pretty obviously in love with her. 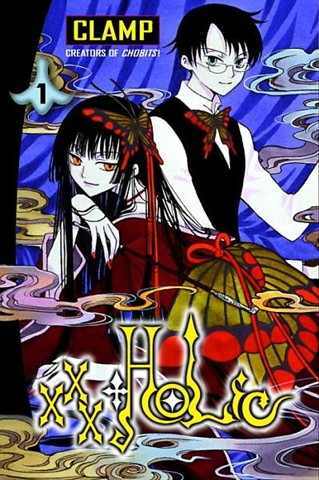 Lots of swooning (both psychical - hence the Arcana bit - and for lurrrrve) and elaborate costumes and smoldering looks. Also a bit of violence - the princess isn't a pushover and doesn't really have anything to lose, since she's really just a hostage and knows she's probably going to be killed sooner or later (her charming new husband casually points this out to her several times). One of the reasons this was easier to follow was there were fewer characters and they all had very clearly defined personalities and roles. I'm guessing this will get more confusing later on. Swoony fantasy romance isn't my thing, but I did enjoy reading this one. I picked up vol. 13 of this because that's what was nominated for Cybils. It was actually pretty easy to pick up the story. 20 somethings trying to make it writing manga, arguments, jokes, relationships, etc. I don't really like stories about 20 somethings trying to figure out their lives, but some older teens do. This was rather slice of life - nothing really exciting happened. 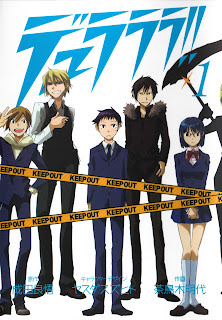 The art was a bit more cutesy with smaller, rounded faces than Durarara!! Still all kinda looks the same to me. 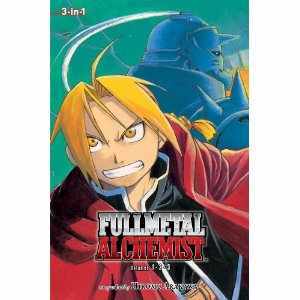 Maybe I should have read a few other manga before tackling this one. 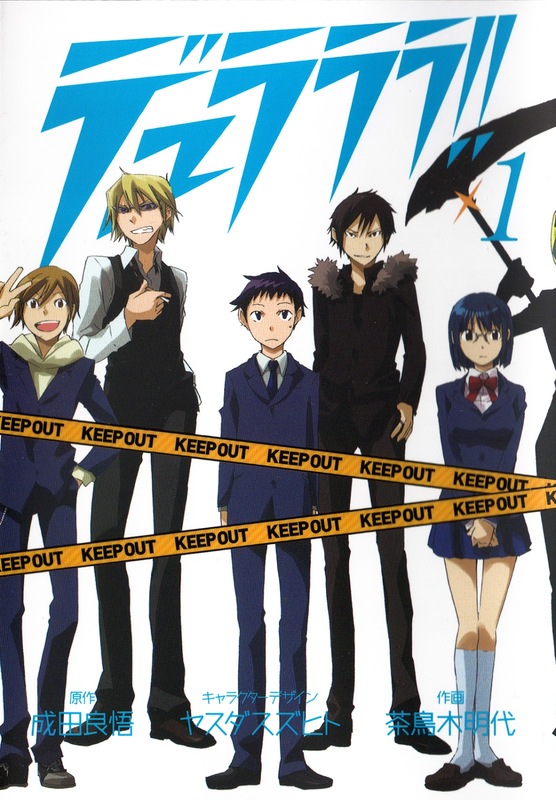 A young teen goes to high school in the big, exciting city of Ikebukuro. His old friend warns him there are dangerous people there, but you rarely see them. Except the teen immediately sees pretty much all of them the first day. He sees this odd guy being stalked by a girl who has a crush on him, an urban legend motorcycle rider, and a variety of scary, possibly gang-related guys. Then a bunch of people get killed in weird and freaky ways and there's some Celtic mythology and...uh...yeah. Trying to make sense of this, I turned to the wonders of Wikipedia and it fleshed out the characters for me a little. It also said this was a "light novel" and I said wha-the-WHAT?? Bodies in suitcases! Teen girl gets throat ripped out! But apparently that just means it's written in a simpler form of Japanese characters. Okey-dokey then. The art...looked like manga. Honestly, I can't tell the difference. Still working on that. I picked this up because it was nominated for Cybils. This continues the story of researcher Mr. Smith and, according to the flap copy, adds a new female character. 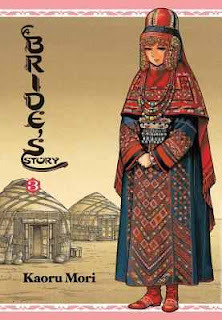 Talas, a young widow, who lives alone with her mother-in-law. The two take Mr. Smith in when his guide doesn't show up but complications ensue. The art is really lovely, very detailed and I liked the darker shading and lines. The proliferation of different hairstyles and clothing made it easier for me to distinguish the characters. I found the setting interesting, but I wanted to know lots and lots more about the Silk Road setting and I had a hard time buying Mr. Smith's behavior. He acts much more like a, well, a teen manga character than an adult European researcher in the 19th century. I guess it might have made more sense if I'd started from the beginning. Now THIS was easy to read! I'm not sure why I found this one so much easier to follow, maybe because it was so simple and there's limited dialogue. Each chapter, or "bone" is a self-contained story, starting with some dinosaur facts, featuring an interaction with dinosaurs, and ending with a punchline, usually involving some dead dinosaurs. There not really any obvious violence, and it's funny in a kind of ironic way. I would say it's meant for beginning readers, but occasionally the humor becomes more subtle. The real problem with books involving dinosaurs is that the facts get outdated so fast. I enjoyed reading this, but again, it wouldn't go on my favorites list. 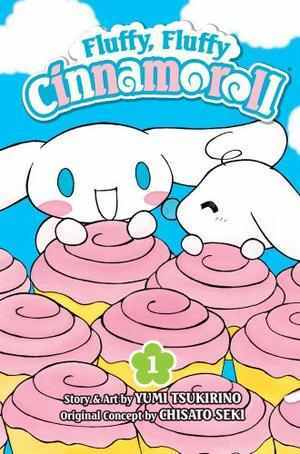 This is a cute, all-ages manga about a little cloud dog with a tail like a cinnamon roll and flying ears. 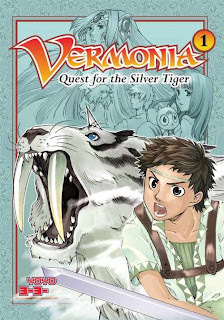 So...kinda like a manga of Care Bears or My Little Pony or something. The section in color was kinda cute at the beginning, but they lost me when I got to the black and white art section. I don't think this was for me either - it's ultra cute and I'm really not into cute. But it really annoyed me how hard it was to tell the different dogs apart. I suppose if they did manga in color it would be too expensive to print, but it would be a lot easier for me to read! 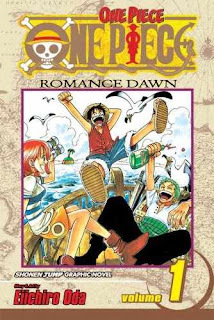 I read the omnibus vol. 1 and 2. My main complaint with manga is not, strictly speaking, the right to left thing - I studied Hebrew and never had an issue with that. The problem for me is the panels and dialogue - I'm never sure which ones to read, I realize I've read them wrong, then I go back and the story gets confused...this one was really easy in that respect because the panels are very straight-forward and simply organized. A teen donated this - it's an early manga. I recognized some of the style of Astro Boy - the long noses and cartoonish look of some of the characters. The storyline was...Precious Moments meets Captain Blood meets medieval intrigue? I thought it could easily have been fitted into one volume, but people kept mistaking each other for other people, stealing boy or girl hearts, changing their gender, getting overthrown, getting shot with arrows...the plentiful exclamation marks and sometimes odd dialogue are probably a hallmark of how old it is and the early translation. Amusing, but not going on my favorites list anytime soon. Not, strictly speaking, manga but I wanted to start something easy. It was interesting at first with the different details of Japanese feudal society, but the gap between the cute little animals and the bloody violence felt odd to me and it got tedious. Borrowed from a library in my consortium. End of year thoughts - 2012 was busy and I did a lot of good stuff, but ultimately it was a year I could have lived without. Not as horrible as 2011, but it could definitely have been improved. As I read back through the year for my yearly report, I remember how horribly busy the winter/spring was. Things are still busy, but I've scaled back a lot and gotten more realistic about what I have time to do. Thinking over 2013, I have some things I'd like to do - winter reading program, after school science club, convince our director to hire a part-time marketing person (please, please, please), expand outreach (although that may not happen due to time constraints), and while I have a really good line-up for We Explore for the winter/spring, I will need to do a lot of work to keep the momentum going through the summer and fall, since that's when I'll need to start inviting people back for repeat visits. I have some grants I'd like to apply for, ALA Midwinter and Annual to attend, decisions to make on committee work in the future - do I really have time? and the excitement of seeing if any of my bulbs come up, or if the squirrels really did eat them all. I'll be working more with our cataloger to do some teen programming, maybe even try starting a TAB again (although she definitely needs to be full-time before we try to have her do anything like that) and several minor shifting projects as well as some little changes to make the children's area more early literacy and family-friendly. I'm looking forward to seeing how the system changes, since our youth services coordinator is leaving and they will be hiring a contract person for 200 hours a year in her place. I have some connections with neighboring ys librarians and I'd like to see what collaborations we can come up with, although that's always a stretch for those who have even more limited time than myself (and..uh..challenging directors). I'm making a few minor changes to the summer reading program, mostly adding a super readers club for ages 6-12, and I'm planning to do a summer reading program for the daycares which will take a lot of organizing. I'd like to get our summer reading numbers up. Right now we're at about 500, which is approximately 1/3 of the elementary age population and I'd like to get that up to half at some point in the future. I can totally do it, I just have to find the right combination of incentives and marketing. I'll have a bigger budget next year, so more collection development, some serious weeding in the teen and juvenile nonfiction areas. Blogging of course! and next fall there will be Cybils. I usually have posts written way ahead, but this fall has been so insanely busy that I only have a couple posts prepared for 2013, mostly nonfiction for Mondays. I'll be doing some intense reading to clear off my to be read shelves and fill up the schedule for the blog, plus there will be awesome new books at ALA to be excited about. I've thought a lot of about career choices in the past few weeks and while I would really love to end up in the Puget Sound area some day, for now I am really satisfied with my job here. As you can see, there is so much to do and try and I feel like I have a better handle on what I'm doing than in the past four years. There are still lots of changes to make and always ways to improve, but I am very optimistic about the future. A short week, since we were only open Wed. - Sat. Of course, that means the shelving was crazy, people racing in to grab stuff before we closed for the next holiday, and the usual grumpy old men complaining about us getting holidays. Last year some jerk was ranting about us all getting 80K (which is ridiculous and our salaries are public so it's not like it's a secret) and going on Hawaii to vacation - to the staff member who came in on her own time over the holidays to empty the book drops and had been at work since 7am that morning. People. Sheesh. More publicity and got a start on program planning. This is a pretty short break, so I don't expect to get everything planned until the next break, but I have to at least know what art projects and crafts I'm doing to I can order supplies and set the budget. Sorrow and Despair - I reached the E's in the lexile suggestion list I am making for 1000+ levels and discovered that Scholastic doesn't let you browse more than 1500 titles. So I have to download the rest in an Excel file, then enter each title back into Reading Counts to get the points, into our library catalog to see if we have it, and add it to the list in the format I'm using. Hate and Rage. This is a lovely story, beautifully told and illustrated. 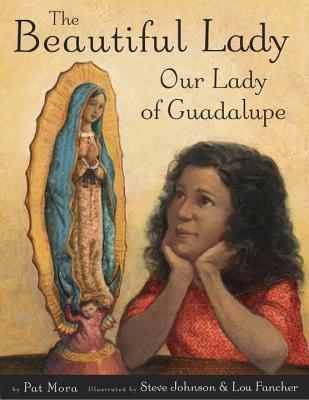 It's the story of Our Lady of Guadalupe, who appears to a simple peasant on a hill outside Mexico City. Unlike the typical Madonnas, "Her skin was brown and beautiful." Juan Diego goes to the bishop in the city and requests he build a church, but every time Juan asks, the bishop demands a sign. Finally, Our Lady provides a sign and signifies her favor to Juan Diego. The story is framed by a grandmother and her daughters making paper roses and rose cookies in a cold December to celebrate Our Lady of Guadalupe. An author's note gives more information about the history of this particular manifestation. 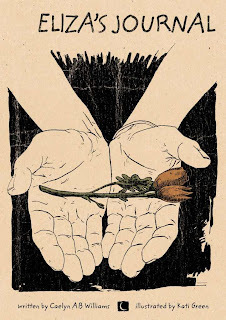 Johnson and Fancher's illustrations are beautiful, as always. Although they don't have the intricate underlying patterns of Ugly Duckling or For the love of music. This is more like It's Milking Time, with the simple warmth and glow of the earth toned art pervading the heartfelt story. I would have liked some instructions on making the paper flowers and cookies, but there are lots of instructions easily available online. Verdict: This is a lovely story, whether you believe in the religious significance or not. It's short and simple enough to make a good read-aloud and the glowing illustrations will make this a favorite for readers. My only reservation is where to put it - I don't see a lot of people browsing the religious section in the nonfiction, but people don't expect this type of story in the picture books. What do you think? I noticed a reprint of this title had been published and liked the cover, so I thought I'd look up the original. It's a really lovely book and one of those vintage titles that will still attract children today, even though it's a bit long for current picture book standards. "Once there was a tiger, a little striped tiger. He was striped with stripes, beautiful black and gold stripes, from the top of his head to the tip of his tail." 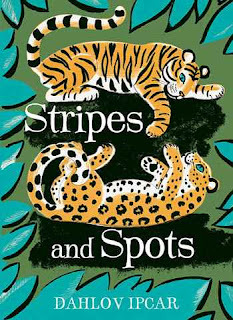 Thus begins the story of a tiger and a leopard cub and their adventures as they search for something striped and something spotted to eat. Happily, by the end of the story they both find something to eat - their mothers' warm, white milk. "Some things have stripes, and some things have spots, and some things are plain, but if they're good to eat, I don't care." says the little tiger, curling up for a lullaby. 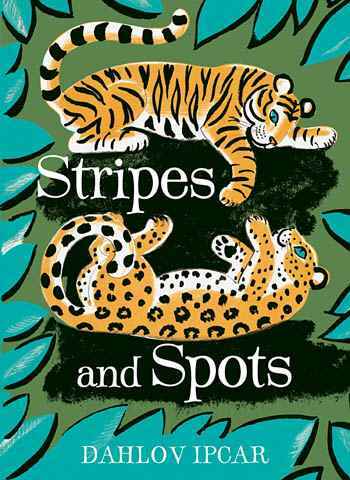 The pictures are rich greens and browns, with the orange tiger and leopard stalking through the fantastic landscapes. There are thick black lines and touches of more orange in butterflies, flowers, and pools. The story reminded me of the cheerful briskness and satisfying rhythm of a classic Golden Book. Verdict: Not many books, especially picture books, stand up to the passage of time but I think this one will make a fun storytime readaloud and be enjoyed by parents and children. Definitely purchasing the new edition. (reprint edition) ISBN: 978-1934031704; Reprinted May 2012 by Islandport Press; Borrowed an original edition via inter-library loan; Purchased reprint edition. We are having a combination Nonfiction Monday post, due to the holidays. Please leave your links in the comments and I will add them throughout the day. I've looked at a lot of craft books for preschoolers, but they're always directed towards adults. This is the first one - the first really excellent one - that speaks directly to small children and their delight in making things. A brief note from Lucy Cousins reminds grown-ups to use safe materials and that it's ok to change the crafts a little and then the crafts begin. There are simple instructions to make a beaded butterfly, cardboard house, painted tree, seed collage, vegetable prints, pencil holder, painted rocks, mask, paper lanterns, tissue paper flowers, vegetable people, clay bowl, pasta necklace, crown, wax painting, collage tiger, and finally decorating cookies. Each craft has a list of supplies and simple instructions in large, clear text. 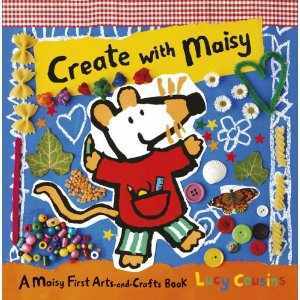 Brightly colored paintings and photography show the creations and Maisy's cheerful enthusiasm in creating them. A final spread has a picture of each craft. There aren't detailed pictures of how to create the projects, but these are so simple it's really not needed. It's easy to see from the picture and instructions how to do the project. Verdict: This will be a favorite not only with preschoolers but also up to second grade, with children who want to do crafts all on their own. The projects are simple and easily duplicated and changed depending on the materials at hand and the child's imagination. Highly recommended, this will fill a gap in many collections. No programs this week. I am working on publicity, collection development, planning storytimes and programs, and my backlist of projects, including a lexile recommendation list, displays, series weeding, magazines, and additional marketing. I am also having an existential crisis about my life and my job. Because life was not stressful enough. Hamster brain! Why are you asking me about tax forms when I am having an existential crisis? Why? According to a dissatisfied patron, I live and work in "hillbilly hell." I find this hilarious. Existential crisis mostly over and I am Zen Librarian again. Pretty hefty snowstorm Thursday. We did not close of course - neither rain, nor snow, nor hail, nor sleet...but I send our cataloger home early and then our director sent me off early. Made it home through the first snowstorm of the year past many a ditched car...and then the library closed at 6:30 because they lost power! Our total attendance for the year is 11,383. This is pretty good, considering that the first year I came it was about 3,000 and almost all of that was Pattie. Eliza isn't really happy about being sent to live with her aunt and uncle on Orcas Island, WA, for the summer. She'd rather be anywhere else - art camp, Florida with her parents, or just hanging around. She's so bored that she even starts writing a journal. Then she meets the Tanners, Charlie and his dad, and gets a job drawing their strange geology artifacts. Uncle Pat is wary and doesn't like her hanging out with Charlie; there's something strange about the Tanners. But Eliza loves her job and maybe even Charlie. Eventually, she realizes her uncle is right - there is something very strange about the Tanners. Craigmore Creations is a small, niche press that publishes books about geology and natural history. I requested a review copy of this title, even though I don't normally review teen fiction, because I was intrigued by the delicate drawings of Kati Green and I happen to be very interested in the Puget Sound area. The art was interesting and I really enjoyed the extra dimension it brought to the story. The story itself is not going to be for everyone - most teens won't be interested. It moves very slowly and the story unfolds at a leisurely pace. Although Eliza's story is meant to be contemporary (she mentions an ipod in the first chapter) her voice in the journal entries doesn't really sound like the average contemporary teen and the text is awkward and clunky in places. She also uses weird word choices like "retiring" instead of going to bed. There are some mild swears, "damn" and "hell" but they feel more like they were put in to show that she was a real, contemporary teen than actually part of her personality. The big reveal - the Tanners are time travelers - seems to have just been thrown in casually and after a little surprise, Eliza pretty much says "ok, can I draw more fossils now?" Verdict: That being said, some teens will enjoy this story. It's different and the art is intriguing. Eliza's awkward journey will resonate with kids who feel out of place with their peers and have specialized interests. I wouldn't hand this to the average teen or add it to a library like mine, with space issues where every book has to pull its own weight, but for a larger library or as a present for a special teen, it would be a success. ISBN: 9780984442256; Published October 2012 by Craigmore Creations; Review copy provided by the publisher; Put aside for winter reading program prize for the teens. This is the third Melonhead story, following Melonhead and Melonhead and the Big Stink. Melonhead (Adam) is getting ready for the fifth grade and there are a lot changes in the air. Lucy Rose and Jonique, Sam and Melonhead are still best friends, but Melonhead's mom has decided it's time for them all to eat a healthier diet and more vegetables. She's also decided that Lucy Rose is a bad influence on Melonhead and he should spend less time with her. The new friend she's chosen for him is Pip, a new girl at school. Pip has her own problems, especially with the tough new teacher who babies her because she's in a wheelchair. 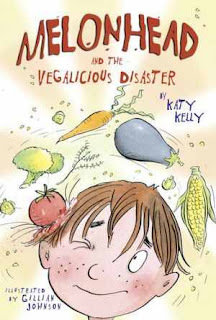 Then things get even worse when Melonhead accidentally hurts Lucy Rose's feelings and his "solution" for his mom's vegetable creations makes a big stink - literally. I love Melonhead so much, but I can't help but think that this one missed the boat. Now, I may be jaded because it was only a few weeks ago that we had to call the police in to deal with some kids fighting, (the ones trying to strangle each other - literally - were 11 and 12, but half the kids watching (and taking pics on their cellphones) were 5th grade or younger), but Melonhead and the whole plot feels very young for fifth grade. I was also disappointed that a lot of Melonhead's personality and character; his love of inventions, his curiosity and interest in the world, is gone. This story is mostly about Melonhead trying to navigate more complicated friendships and family relationships, which would make for a more mature story, except the humor and main plot point, the vegetables, is so juvenile. On the other hand, kids that age do swing back and forth between behavior that would be infantile for a kindergartener and maturity that would make a 40 year old look naive. Verdict: Well, in the final verdict I'm not totally happy with the book, but I'm not sorry I bought it. I think a lot of 3rd and 4th graders will still enjoy the story, but I don't see Melonhead moving on to an older audience and I would have preferred more stories specifically for the same younger age group that the previous titles aimed at. Twenty-seven extinct (or nearly so) animals are presented in this oversized book. They range from the prehistoric to the modern and across the map from the Americas to Oceania. Each full page spread presents a six-panel cartoon strip telling a legend, story, or conversation between the animals on the right and a large illustration of the animal and further information on the left. Some of the animals include the Malagasy dwarf hippopotamus, which some scientists think is the basis for the legendary monster kilopilopitsofy, and which is accompanied by a fictional comic of an encounter between a Malagasy native and the hippo. Then there's the elephant bird, thought to be the inspiration for Sinbad's Roc. The woolly mammoth spread includes a brief exchange between the scientists who disinterred an almost perfect specimen in 1997 and the Chinese river dolphin also includes a science expedition, this one in 2007 when scientists concluded the dolphin was extinct. Additional information on each of the four land areas - the Americas, Africa, Eurasia and Oceania - is included at the beginning of each section. An in-depth glossary and further illustrations and timeline of the extinct animals is also included. I did think the introduction was a bit grandiose, especially when it says "Few books dare to touch on humanity's role in wildlife extinction." I can't think of a single wildlife title I've purchased for the library in the past few years that doesn't touch on this, but this is a French import, so maybe their children's books are different. The art is very interesting and it took me a while to realize that it strongly reminded me of the botanical drawings of the 18th and 19th century, but with color. There are touches of humor in the cartoons, although they do all have a sameness about them. I did like the silhouettes of the extinct creature vs. a human, so you can see the relative sizes. 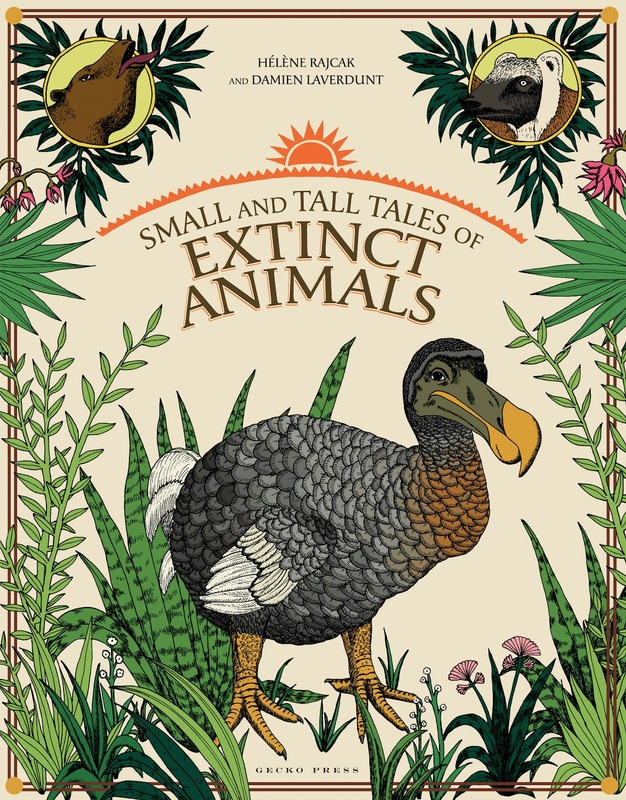 Verdict: This won't be for everyone, but the very different illustrations and the variety of information will interest some kids, especially those who have outgrown dinosaurs but are still interested in prehistoric creatures. I would have liked a little more background information and knowing how they decided how to picture some of the prehistoric creatures and more about the final sighting and how they were determined to be extinct, but it's a good introduction to extinction, biodiversity, and folktales. This week's extra activities included a summer showcase at another library on Monday afternoon, Scholastic Warehouse sale, and a Youth Services committee meeting. One staff member is recovering from surgery, I had a stiff neck that made it very painful to do storytime and work at the computer, somehow one of my boxes of books got left at the warehouse sale (an HOUR's drive away and could I get in contact with the warehouse? Noooo), and it's just been that kind of week. The middle schoolers can, of course, sense weakness and have produced their most obnoxious behavior, we had 3 police visits by Wednesday evening and...yeah, one of those weeks. Scholastic sent my missing box! I take back all the things I said (except for the ones about Reading Counts). Encountered the WOMBAT SKEPTICS at the daycare, an entire class who refused to believe that such an animal as a wombat really existed. I was telling it as a funny story to a parent at Lego Cub later that afternoon and smart-aleck T (he's about 7) turned around and said "wombats don't exist!" 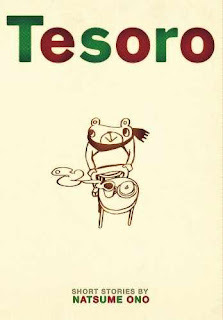 Clearly, I need to booktalk Nic Bishop's Marsupials more. Santa's Kitchen - this year I am keeping track of what I bought! About 50 wire stars from the local bead store to make ornaments (about $30 I think? ), about $20 Christmas candy decorations plus holiday tablecloths, plates, and napkins from Walmart, 250 plain sugar cookies in various shapes, red white and green frosting (8 lbs?) a few more decorations, and waxed paper for $122 at Franks, the local grocery store. Of COURSE nothing ever works the way I hope. I got there at 9:45 and it wasn't really enough time to set up. The tablecloths were too short and I hadn't bought enough, but I had some plain ones in the back. I grabbed a grandma who was waiting and used to be one of our volunteers and she helped dish out frosting. It was the right number of cookies, decorations (3 tubs of sprinkles, 3 tubes of sprinkles, 4 bags of M&Ms, 2 boxes of xmas Nerds). We didn't use the wax paper. I couldn't find my bead pliers and we needed LOTS more than just one pair of needlenose pliers for the craft, but the kids had fun with the pipe cleaners. Nobody really came for the cookie swap, but the high schoolers sang well and enjoyed having cookies afterwards. We also had popsicle sticks for spreading frosting, plastic spoons for scooping decorations, beads, lots and lots of paper plates, pipe cleaners. I think we had about 60 people! Everything is changing, and Tilly is worried. Mom is having a baby and it's not going well, she sleeps all the time and seems to be getting worse. Dad is worried about Mom and busy with his book. They've just moved to a new house, leaving Tilly's best friends behind. 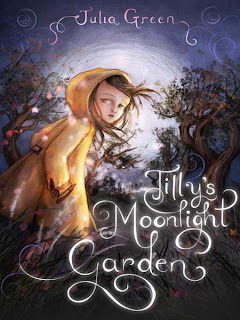 Lonely and unhappy, Tilly discovers that their new garden and the wilderness behind it hold special secrets; foxes and a magical girl named Helen. Slowly, things change and improve and by the time Helen leaves Tilly has found a new friend and all is well in her family again. This is a slow-paced, magical story. Is Helen a ghost, a dream, or just Tilly's imagination? The story never says, gently hinting that Helen was the friend Tilly needed to help her through her worries. With the arrival of brisk, cheerful Grammy and her new friend Susila she doesn't need Helen any more. The story is full of lyrical descriptions of the garden, winter, Christmas, and the foxes. The black and white art that delicately brings out the magic of the story is perfect, capturing the delicate imagination of Tilly and the beauty of the garden. It's a very British story, with words like "lorry" and "metre" as well as the gentle unfolding of magic and mystery, reminiscent of Pearce's Tom's Midnight Garden. This won't deter reader who love gently mysterious stories and will appreciate the art and beauty of the story and illustrations. Verdict: A perfect length, 220 pgs, for intermediate readers. Hand this one to kids who enjoy beautiful language and description and will sympathize with Tilly's shyness at school and her private worries. Oooh, a teen review! This is probably the last of my handful of teen reviews for the year. 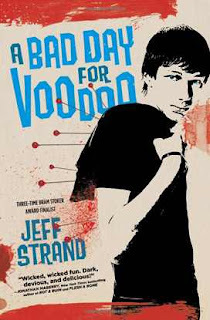 I rarely review teen titles, so you know this one has to be extra, extra good right? Well, not really. It's more that it appeals to my somewhat odd sense of humor. I generally don't read "good" books. I do collection development for the teens through a combination of Junior Library Guild, bestseller lists, review journals, teen requests, and suggestions from other librarians who are more teen-centric than I am. Teens at our library are pretty much ignored unless they're making too much noise. I do skim through everything I buy though, which is how I found this title. So, Tyler is a pretty average sophomore. He's not a genius, but he studies hard, has a girlfriend (Kelley) and is still a little surprised that she picked him, and has a sort of best friend, Adam. He's pretty mad that his nasty history teacher, Mr. Click, gave him on F on his history test. It wasn't his fault that one of the biggest, toughest guys in school cheated off his paper! Tyler is thinking of telling the principal, but Adam (who might just be a little psycho) has a better idea: Voodoo! Tyler thinks the whole idea is crazy, but one little accident later, there are body parts flying, then dead bodies, thugs, police, insane religious cults, and he's missing a significant number of toes. Several wild car chases and a lot of blood later, the story is over and the reader is sick with laughter (or just sick, depending on your tolerance level for gore). The violence isn't actually that graphic, descriptively speaking, except for maybe the part with the ear. This story reminded me really strongly of the Deadpool comics (of which I am a big fan). Authorial interjections (both from Jeff Strand and Tyler himself, who tells the story), snarky jokes written into the text, like a book review cheat guide chapter and a missing chapter replaced by a letter from the fictional editor, lots of witty dialogue, insanity that's somehow logical, and gore pepper the text. The characters themselves are hilarious starting with the narrator, clueless good guy Tyler "I advocate peaceful solutions to conflict whenever possible, and there are very few circumstances under which it's okay to bash somebody's head against the wall. I feel that this was one of them." Psycho neurotic Adam, "He gave us a smile that was a combination of Oh yeah, dude, I'm totally evil and I want my mommy." Snarky smart Kelley, "You know Tyler, I'm putting up with a lot for a relationship that was never going to last past high school." There are a couple points where the additional material is a bit too much - the editorial letter was kind of annoying and the final FAQ could have been left out - but overall this was a funny, funny read and I enjoyed every minute of it. Verdict: As the author says, "[you have to] think that people losing body parts is funny, because that's basically the whole book." Teens who like funny, bloody, and weird will go for this. It never crosses the line into gross or graphic and there is lots of snark. So, basically, anyone who likes Deadpool but less graphic. 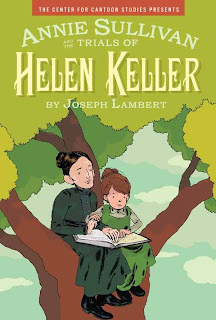 I recently reviewed a picture book biography of Helen and Annie and was bemoaning the fact that their relationship, and Helen's water epiphany, are so overdone - do we really need yet another biography? If it's this title, we do. This graphic biography, produced by the Center for Cartoon Studies, chooses a different approach, focusing on the life of Annie Sullivan. Starting with her meeting with Helen, it intersperses her own tragic and difficult childhood with her work with Helen, letters home, and interactions with the Perkins Institute. Although the story deals with mature issues, from the abuses at the Tewksbury Almhouse to the inequalities suffered by women and the disabled, they're presented in a way that doesn't negate their impact but is still appropriate for middle grade readers. The art is presented in a stream of small panels. It's easy to follow the jumps between Annie's childhood and Helen's, since both Annie's wear shades of blue and wear their hair in the same style. The text is written in a variety of fonts, from rough capitals for Helen's changing speech to simple cursive for Annie's letters home. One of the most moving aspects of the art, which gives fresh meaning to a familiar story is the depiction of Helen's world. It starts with her alone in the dark, a formless child figure. As Annie breaks through to her, her world slowly grows until the pivotal moment when it explodes with language and images. This isn't a title to hand to reluctant readers, just because it's a graphic novel. The text and images are small and precise and the story is complex. To fully grasp the story, readers need to know a little of the historical context of the time, although this story might also inspire them to do some extra research. This is a title for middle school readers, especially those interested in stories of struggle and triumph, history and biography, or relationships. 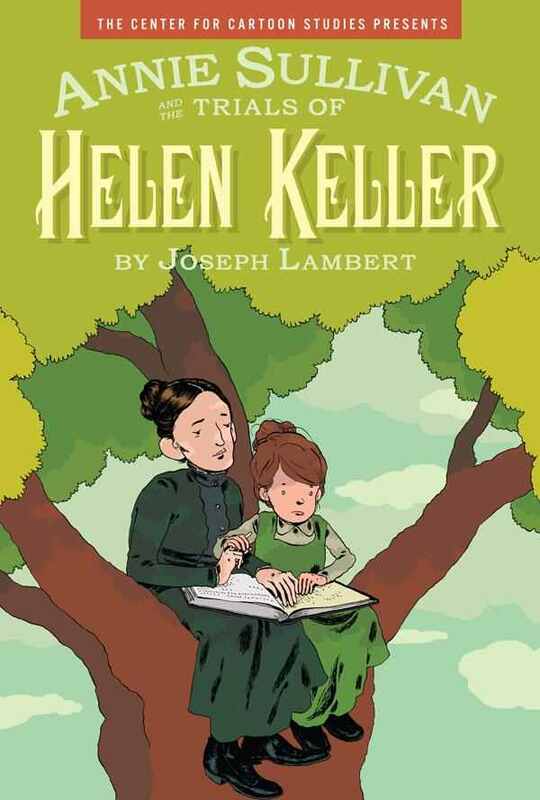 Verdict: This is different than any of the other Helen Keller and Annie Sullivan biographies glutting the market. Definitely add these for your more thoughtful middle school students and high school readers. Had a very disappointed boy who just couldn't believe there were no more Ricky Ricotta books. He was sure there were "five thousand" because "it says so in the back of the book!" I got him to take Melvin Beederman instead, but I don't think he totally believed I was telling the truth and not just hiding those 4,993 books somewhere. This week begins a round of various committee meetings and webinars. This week I had an ALSC committee meeting, beginnings of final Cybils discussions, and webinar for new titles from Lerner (I like the look of some of their graphic novels and nonfiction). It's really hard to do all these snow-themed storytimes when it's 50 degrees outside! I need to move farther north! This has not been a particularly good week. Zen Librarian is losing her Zen. The familiar folktale of the Tortoise and the Hare is retold here with an all-new set of animals and stunning original illustrations. Kanchil the mouse deer is the boaster, sure that he's faster than all the other animals in the forest. 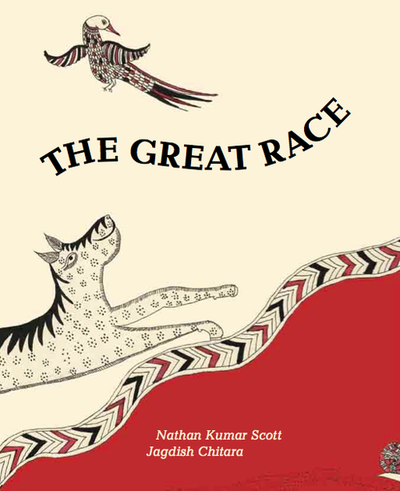 He decides to challenge all the creatures in the forest to The Great Race to show them all how he is the fastest. All the animals gather, but the only one willing to race Kanchil is Pelan the snail. Pelan the trickster wins the race not once but twice and Kanchil learns a lesson in humility. The illustrations are created by Jagdish Chitara, a member of the Waghari community. They create a traditional sacred cloth called Mata Ni Pachedi, Cloth of the Mother. The art in this story is in stark red, white and black, with stylized versions of the animals and elaborate designs. The art swirls from page to page, recreating the circular designs of the traditional cloth while creating something new. While the style will be unfamiliar to most children, it's accessible and the different animals are easy to identify. The end notes explaining the artist and his art were interesting, but I would have liked some additional information on the origins of the folktale. According to the back cover, it's an Indonesian folktale and Kanchil is a traditional trickster character, but that's all the information that is given. 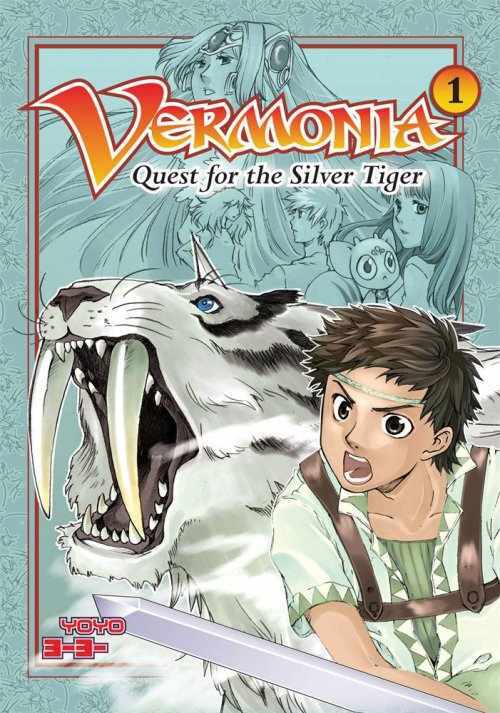 Verdict: This is a new and interesting folktale; familiar enough in subject and art for children and adults unfamiliar with the culture to connect with, but different enough to be intriguing. It would make an excellent storytime choice as well. 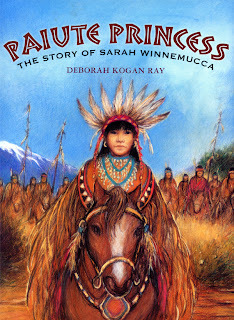 I've read some other books about Sarah Winnemucca, or at least I assume I have since most of her story was familiar to me. However, there was quite a bit of new information in this biography. The story begins with Sarah's grandfather, Chief Truckee, and moves through her early childhood, her movement back and forth between the world of the white people in California and her own people and her choice to use her language abilities to stand up for her people who were losing their lands, rights, and often their lives. 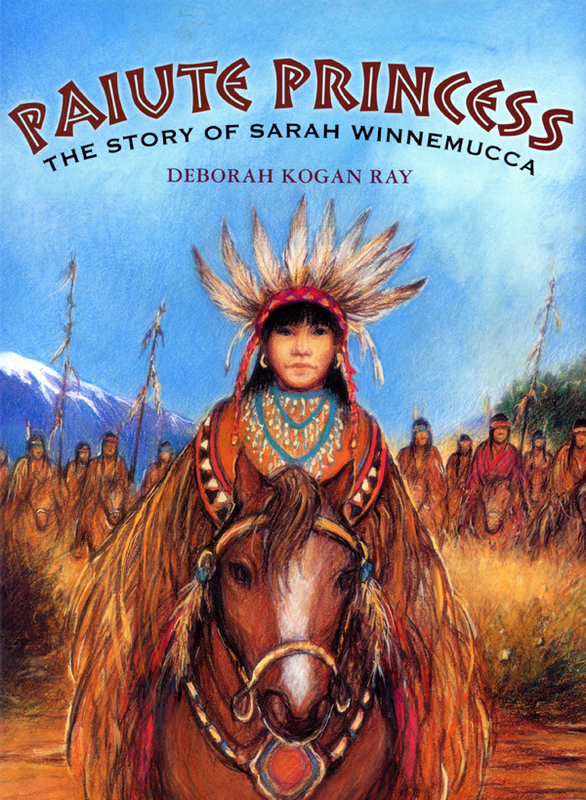 There's no happy ending to this story of course; although Sarah did manage to get her people returned to their Nevada homeland and also run a successful school for several years before a policy of forced assimilation and boarding schools was enacted. Ray's illustrations have soft edges and glowing colors, showing the beauty of the land Sarah and her family loved and the suffering and trials of her people. There's extensive research included in the back matter, including explanations of the differences between the names and perceptions white people gave to Sarah's people and their own traditions - the position of "princess" didn't actually exist in her tribal structure for example. Photographs, information on Sarah's work with Senator Dawes, and the tragedy of the Indian schools are also included. A timeline and author's note are also included. Verdict: Well-researched and a sensitive topic is handled well. There's nothing inappropriate for the age range, but the tragedies aren't glossed over. A very balanced portrait of a complex woman. Sadly, again, my library patrons really don't like picture book biographies. I can see this doing very well in a school library or a much larger library perhaps. Refilled the bean bags with the help of another staff member. Always a proceeding fraught with interest and coughing. Acquired a hamster! I was throwing around random ideas for a new pet (since all the fish died) and my aide asked if she could get us a hamster and be in charge of it. I am very cool with this idea. A patron donated an aquarium with top and we have lots of suggested names (not particularly good suggestions, but there are a lot). High points of Monday - kicking out all the middle schoolers who were discussing the finer points of their planned obscene drawing, apparently under the illusion that the study room walls are soundproof. I've told them a gazillion times they aren't, but they're still shocked when I can hear them. And one of the preschool teachers happened to drop by so I could save myself a trip to the school Tuesday morning. One less thing to do! And the group of teachers etc. in small groups at every study table downstairs, doing their math testing or whatever it was. Wednesday - wondered where all my Preschool Interactive families were. Realized it was sunny and warm and they were probably at a play group at the park that's held every month. Thursday - wondered where all my Lego Club groupies were. Started counting mentally and realized that at least half the population of the town is sick, including most of my Lego kids. I did have three or four new families, which was nice.